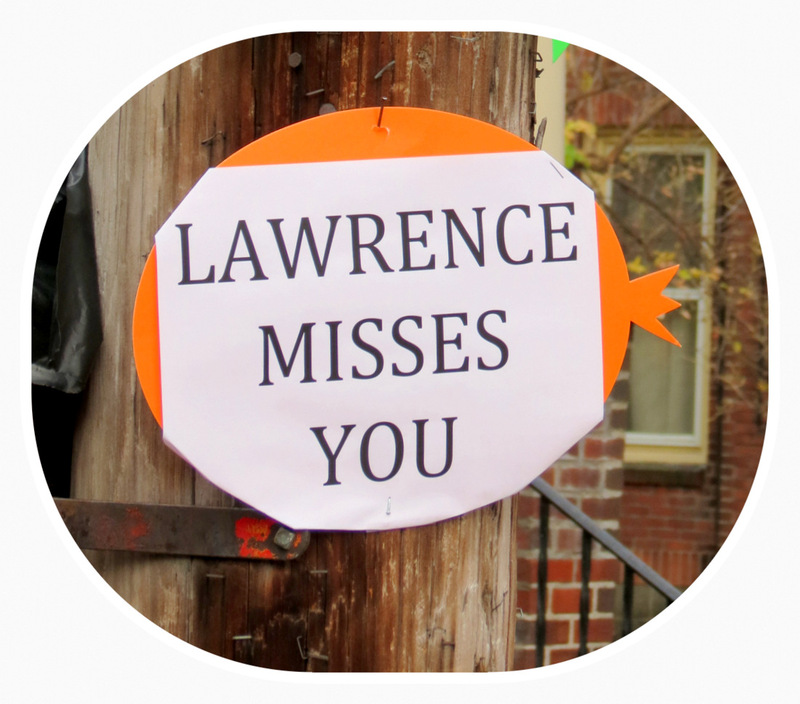 You can find hundreds of photos of this website’s coverage of the Stockade-athon as it has “stormed the Stockade” neighborhood and visited Lawrence over the past five years, by using the links found here. 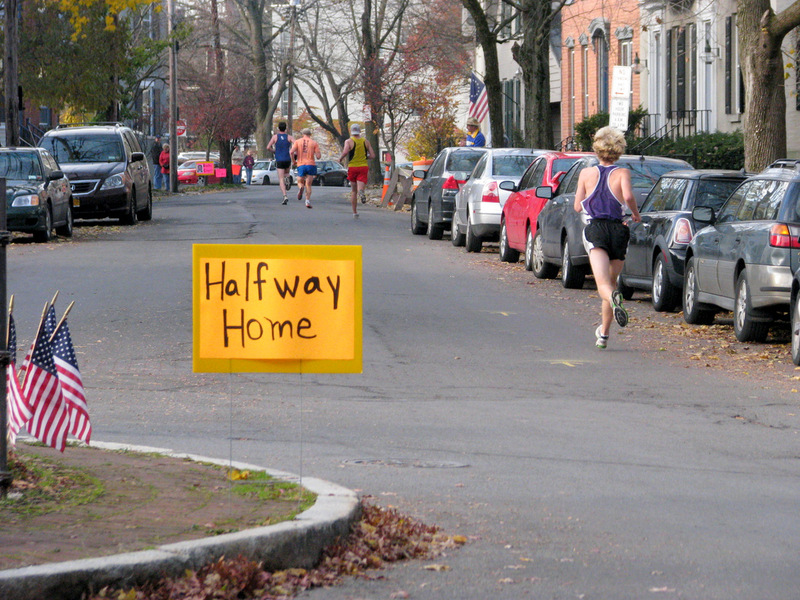 Up until this Sunday, November 9, 2014, the halfway point of the Stockade-athon Road Race (its physical and symbolic center) has been Lawrence Circle, in the heart of the Stockade neighborhood for which the Race is named. As of Sunday, however, the Race will at no point pass by the Statue of Lawrence the Indian in his spot of honor at Lawrence Circle. Instead, the halfway point of the Race will be somewhere three miles away along Dean Street. “All runners will exit the park within 15 minutes of the start and leave the Stockade“. In addition, a long stretch in the Stockade of Front Street, which intersects Lawrence Circle, passes by the historic Arthur’s Market, and includes some of the Stockade’s loveliest and most stately homes on its way to Washington Avenue, has been removed from the race course. 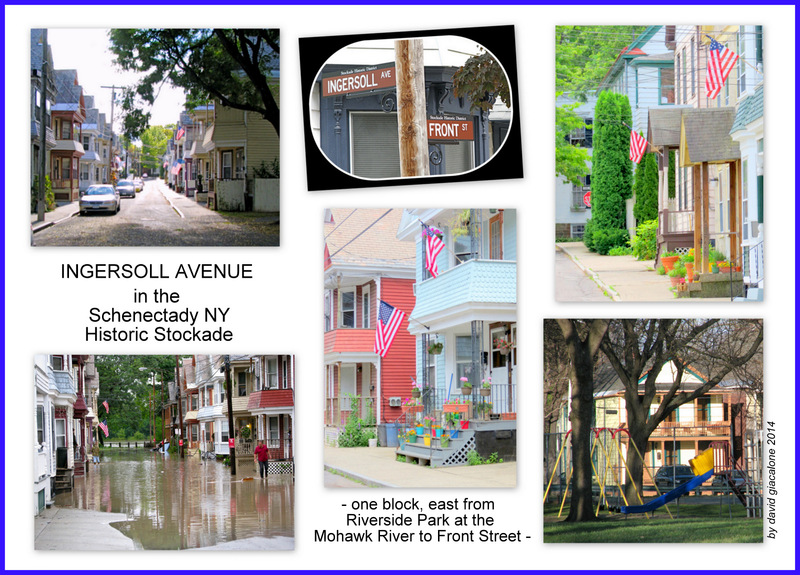 It has been replaced by a short block of Washington Avenue, and by a quarter-mile stretch of asphalt ten feet wide that traverses the entire length of Riverside Park alongside the Mohawk River. Ingersoll Avenue, a more modest Stockade block, has been added to move the runners from the Park out to Erie Boulevard and Nott Street, via the east end of Front Street. Click here for a full map of the new course. 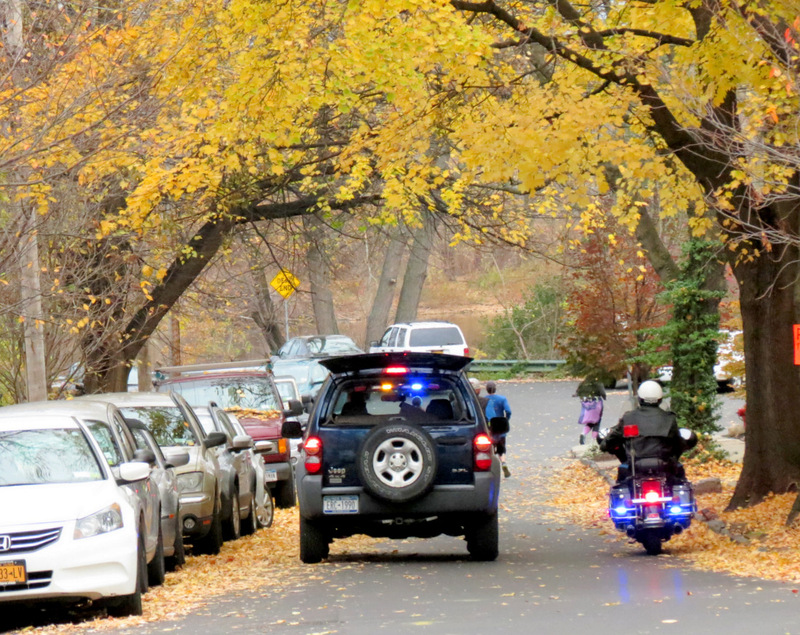 update (Nov. 9, 2014): Sad to say, as a photographer and a spectator, the Stockade portion of the Race was frustrating and far less enjoyable than prior years. 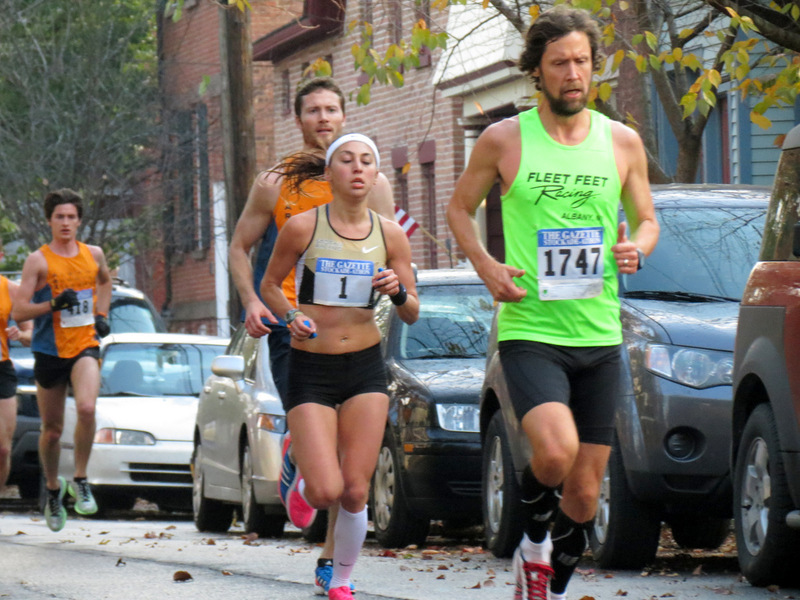 The results can be seen in “Stockade-athon 2014 comes early to the Stockade” (Nov. 9, 2014), which has over 80 photos taken during the Race. 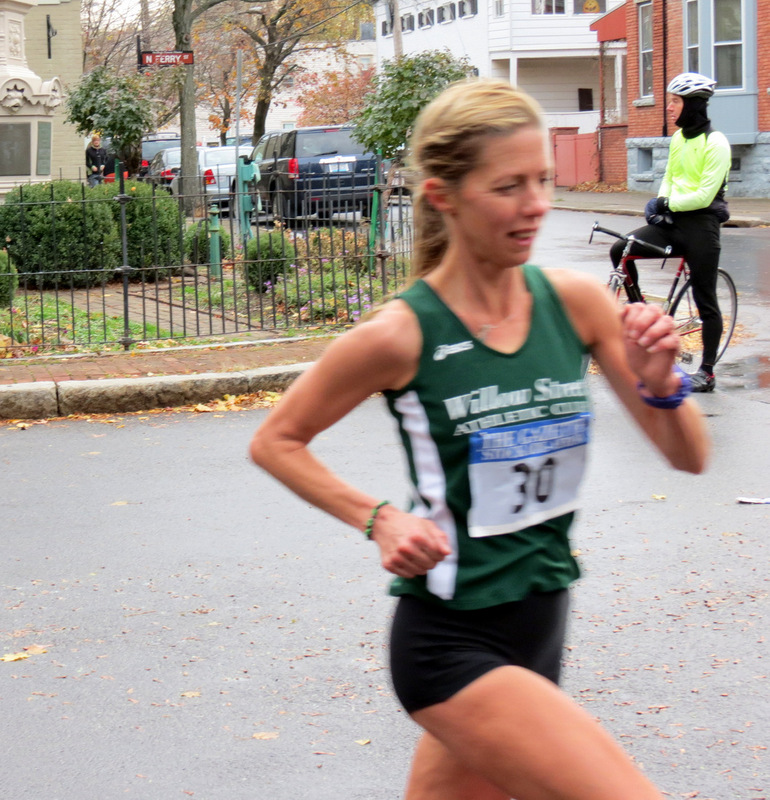 Race coordinator, Vince Juliano, explained in a Memorandum last June that about 1.5 miles of roadway had to be added to the course, to make up for a large section of Central Park that formerly was traversed twice (at the start and finish of the race). 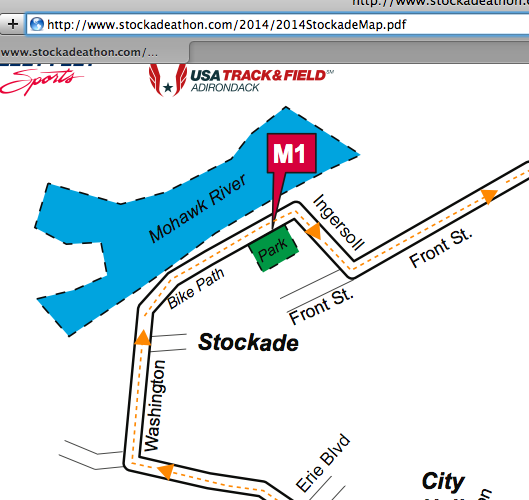 See “Stockade-athon enters new era” (July 28, 2014). 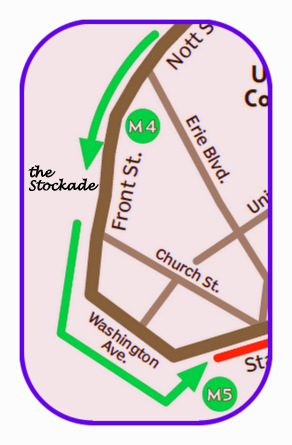 These alterations in the course are part of a redesign meant to accommodate the ever-increasing number of Stockade-athon participants, which has the Race starting downtown near Proctor’s and ending downtown near City Hall, rather than having its Start and Finish at Central Park. 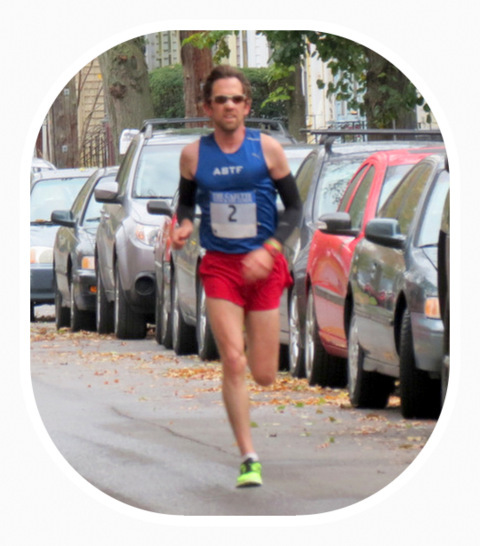 “We used to start and end in Central Park and the runners would go through downtown. Now we have basically flipped it, the course is the same, just the start and finish points are different. . . .
Mr. Juliano deserves our thanks for the fine job he does organizing the Stockade-athon each year. And, starting and ending the Race downtown seems to have quite a few advantages. But, the needless amputation of Lawrence and much of Front Street from the Race course, while he says “the course is the same” and the “course really highlights the neighborhoods,” does not ring true for Stockade lovers and Lawrence acolytes. It may also irk the runners who will be funneled between the columns that now mark the entry to Riverside Park and then be bottlenecked on that narrow piece of road tar for the length of the Park. If you are not familiar with Ingersoll Avenue, click on the above collage for a half dozen photos of its many porches and up-down duplexes, and narrow roadway. If you are not familiar with Riverside Park, and especially if you will be running through it on Sunday, you might want to take a look at the photo to the right of this paragraph and those in the collage immediately below. It is a small, lovely Park, much appreciated for its relative calm despite being on an urban riverfront. But it is not the first place this non-runner would think of to direct 1500 or more runners early in a well-regarded 15k race course. 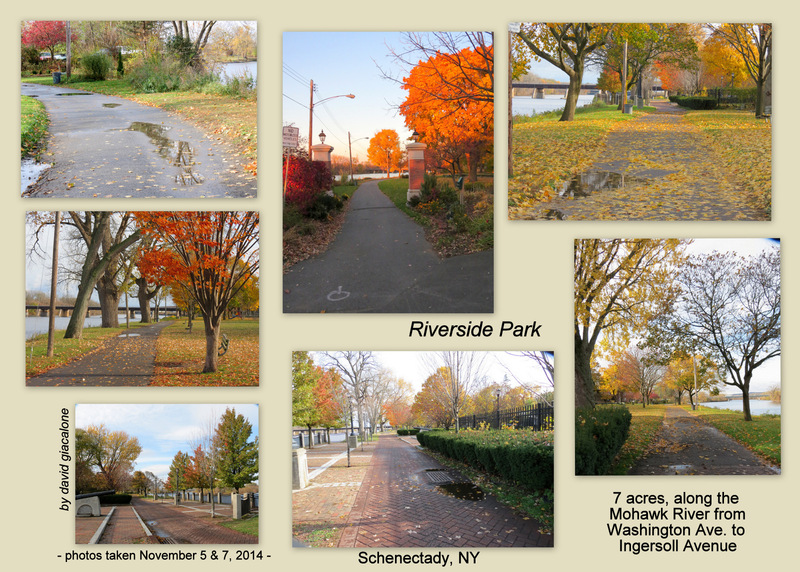 The “bike path” mentioned by the Race Committee is Riverside Park’s sole sidewalk, which was widened to ten-feet of asphalt rather recently and dubbed a connector segment of a well-established “bike path”. By the way, despite the tiny green rectangle used to designate Riverside Park on the official Stockade-athon Map, the Park stretches the entire distance from Washington Avenue to Ingersoll Avenue, and is not merely an afterthought stuck on a bike path. 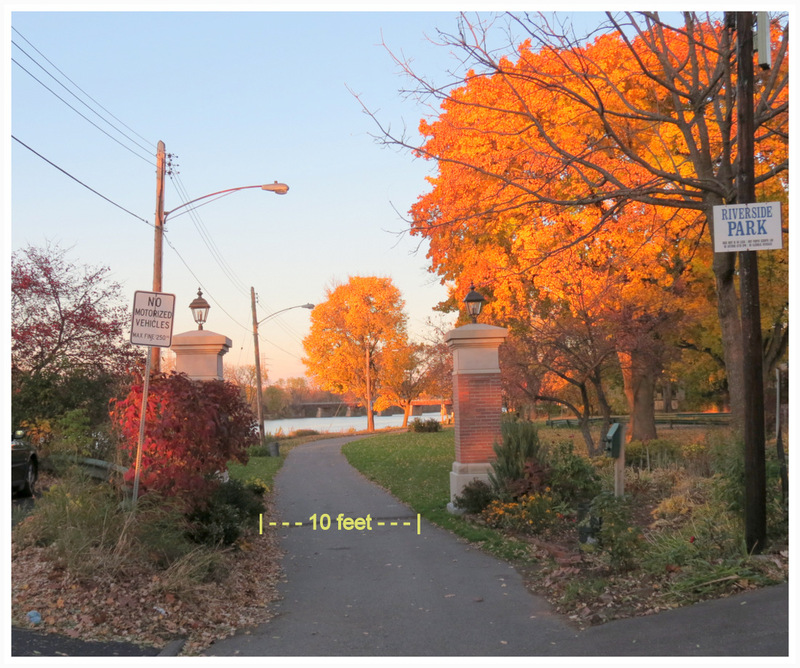 As the above photo shows, two large columns create a rather grand entrance to Riverside Park, and give the runners about 12 feet of width to pass through before immediately returning to a 10-foot path, flanked by a flower bed and park lawn. This time of year, the path and entire park often have a cover of fallen leaves (the photos in the collage below show how many leaves fell in the two days between the above photo and ones taken yesterday, November 7). Another charming and chronic feature of the path is its many puddles, which were celebrated at this website in a 2010 posting entitled “rainboots and puddles in Riverside Park“. I am not sure the great mass of runners will be celebrating, or charmed by, the puddles I saw yesterday, along with slippery leaves on the path and the grass. Early in the race, the frontrunners may be spread out single-file or in small groups, but the frequent large groups that I’ve seen when taking photos near the halfway marker of the Race, might be expected to be even larger prior to the 1 Mile mark, and unable to pass or spread out when funneled down the ten-foot-wide sidewalk. I’d be interested in hearing the pre- and post-Race opinions of the runners about their trip through Riverside Park. 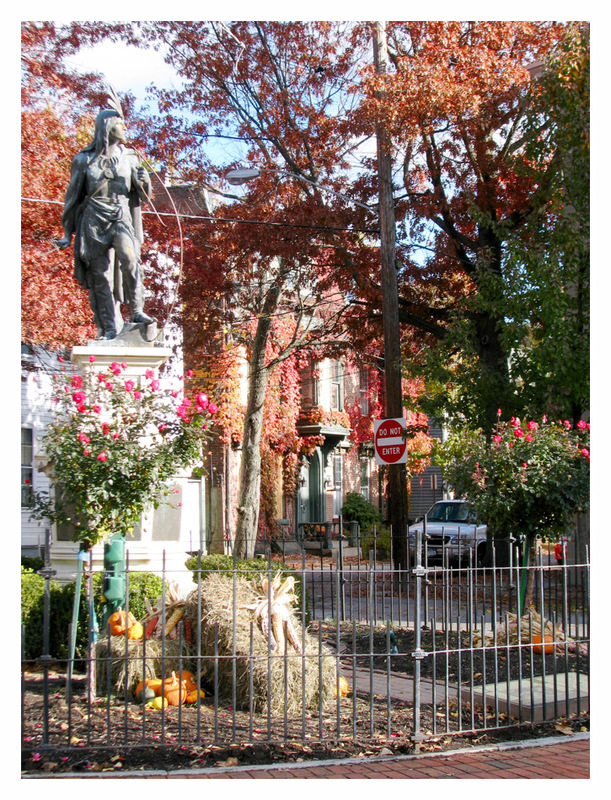 Lawrence Circle with its statue of Lawrence the Indian is the heart of the Stockade and has always served as the Halfway Point of the Stockade-athon, giving the Stockade neighborhood its due as the source of the Race’s name and certainly some of its class. 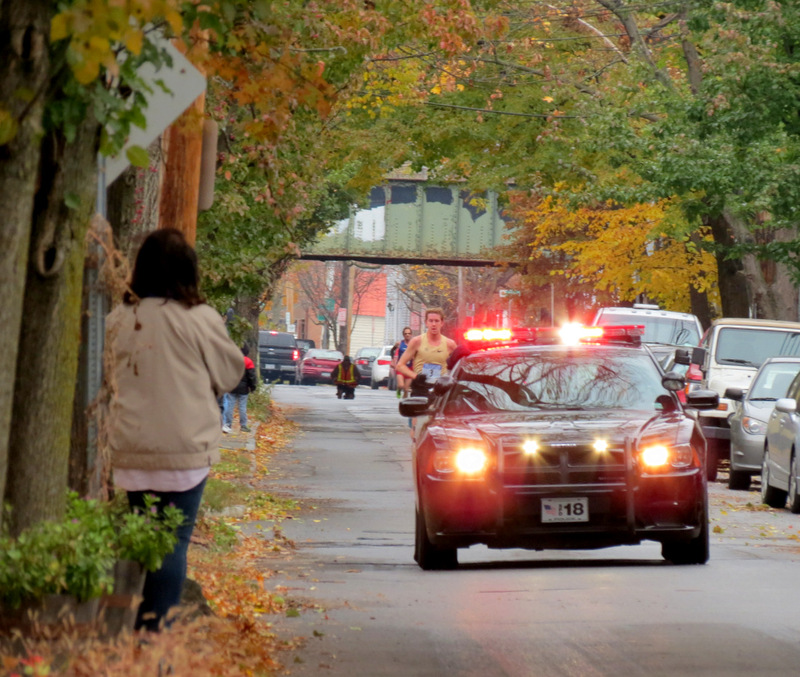 Lawrence Circle is where the majority of neighbors who want to cheer on the runners cluster, as do photographers. (Front and Church Streets is another convenient and attractive gathering point that will be lost.) The event’s Spectators Guide says Riverside Park would be an “ideal” spot for residents to watch the race, but it seems neither practical nor satisfying for neighbors to “gather” in a 7-acre Park for an event that will take less than a dozen minutes. 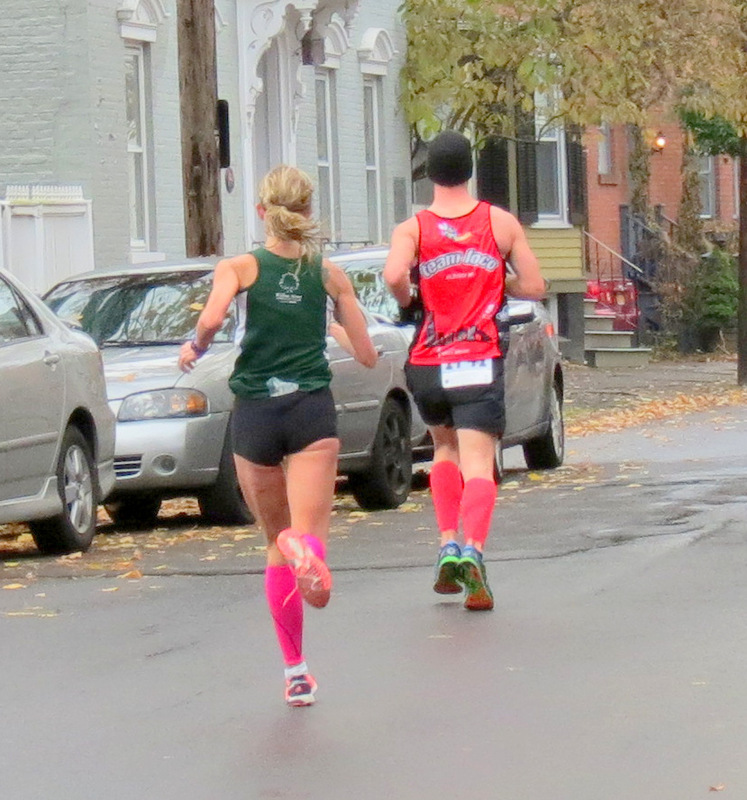 For at least the past two years, the first two men and first two women to reach Lawrence Circle were also the first two runners at the end of the race, which means Stockade residents get a good look at the leaders and a stake in the results. Runners seem to run a little harder coming up Front Street, both approaching and departing the Circle. The Circle can often be seen glowing with sunshine as the runners pass through the shade of trees and buildings on Front Street. 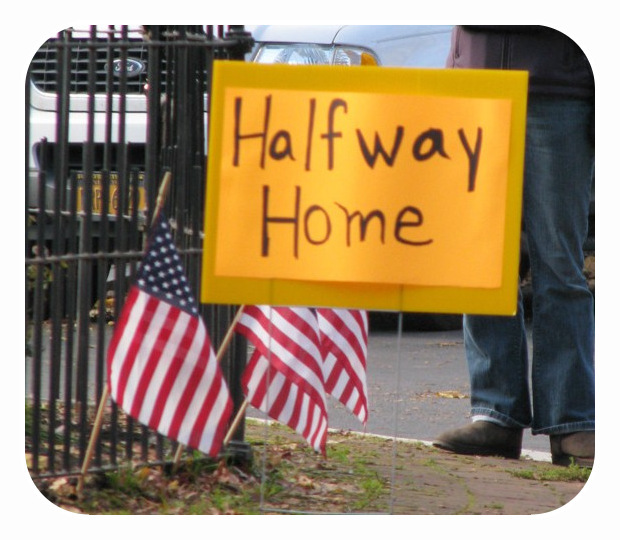 The sight of “Halfway Home” signs at the Circle, combined with cheering spectators, and ringing cowbells also makes Lawrence Circle a special location on the Stockade-athon Course. 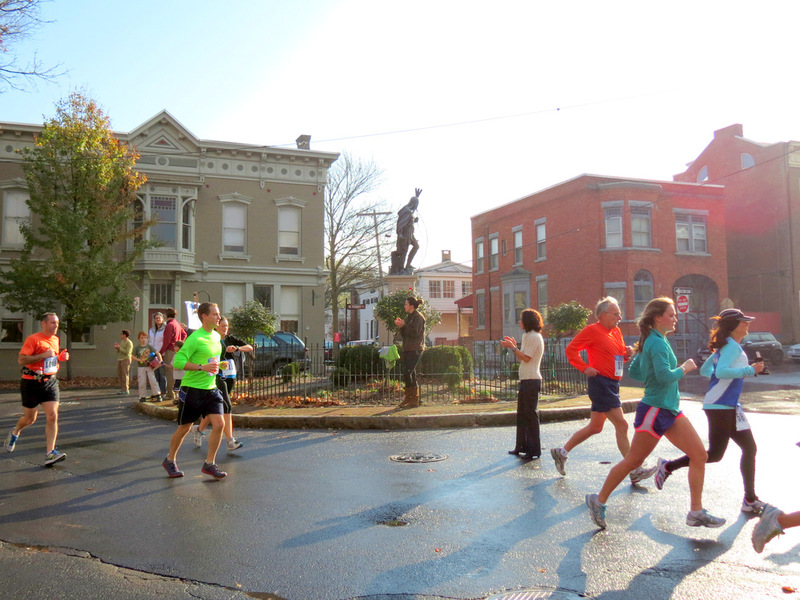 The following Slideshow has about 40 photos of Stockade-athon action approaching, at, and departing Lawrence Circle. I hope the Stockade-athon Course Design Committee can find a way to revive this Stockade tradition in 2015. And, I hope my creeky knees and hands will be able to snap an adequate number of interesting, telling, and enjoyable pictures in that 12-minute window when the Stockade-athon is “highlighting” the Stockade. One thing I didn’t like about the Stockade section was that it gave short shrift to the actual Stockade. It was nice to run by the river but through the years I’ve felt the Stockade was well supported and the most fun part of the race with cheering crowds by the statue of Lawrence. It’s also one of the gems of our city and I was glad others got to experience it. Hanna Davidson was the first woman to reach Lawrence, with Laurel Leone close behind. They finished the race in the same positions in the Women’s Division. 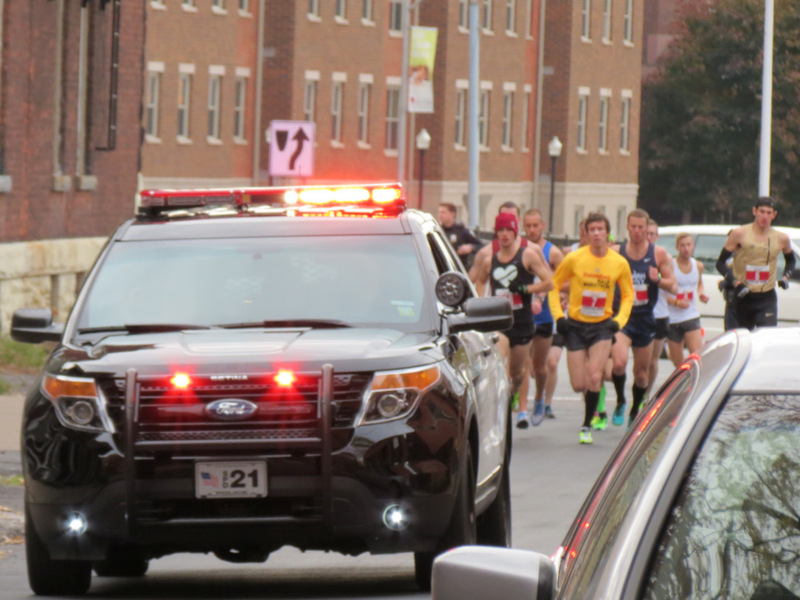 They were also the first two runners to reach the Lawrence Circle last year. [R] BIB #1, 2012 women’s division winner Maegan Krifchin, at the halfway point; she talks about running with this group of men from this point in a Gazette post-race video. 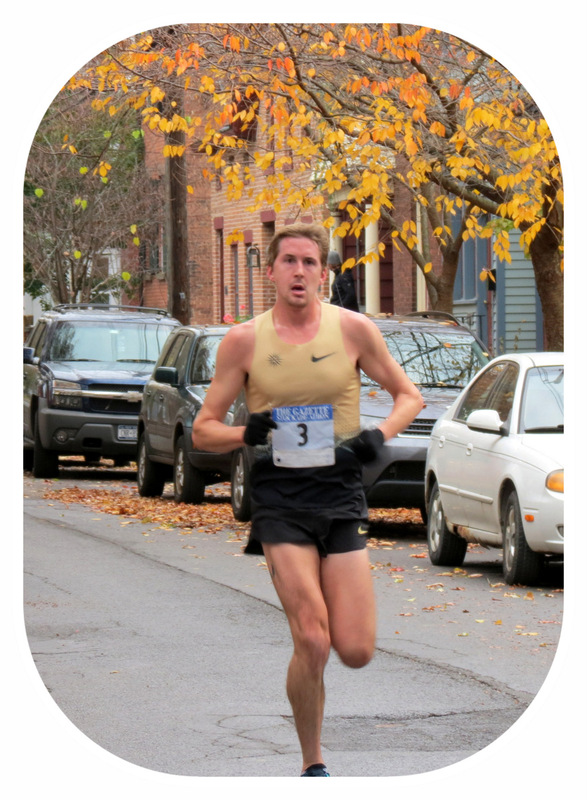 Schenectady Gazette sports reporter and columnist Mike MacAdam tells which of the elite runners will be in the 2014 Race, in an article in today’s Gazette. 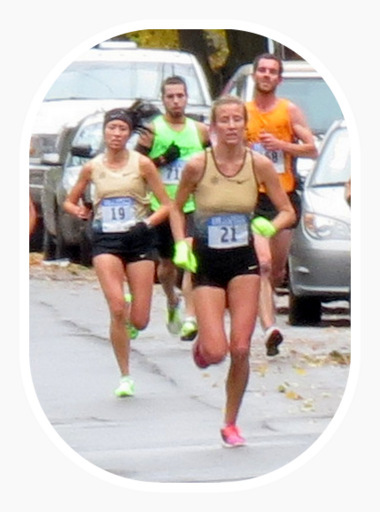 Krifchen and Hanna Davidson will be in the field on Sunday in the women’s division, as will Saratoga Springs’ Megan Hogan. Although Fout and Simpson are not coming back, 2012 champ Christian Thompson will be back this year, with stiff competition from Eliud Ngetich, a 20-year-old from Kenya.